This is Exessa's daugther by *Erystawi, Exalicja. *Erystawi was a circus horse who was imported by Erik Erlandsson and then reexported to the US. It was the same group of stallions that included *Aladdinn's father Nureddin... Exalicja is the dam of three exports to the US, one stallion to Norway and one mare to Finland. 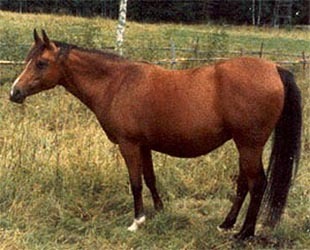 Her son Kasztan by Maz was owned by Swedens Ponnyklubb were I used to take lessons. Exessa is the dam of several mares, among them Herbata 1983, and stallions *Exeter 1985 and *Essex 1986 by *Probat and Espri 1973 by *Espartero. *Edessa by *Pietuszok was a daughter of Ellora and thus a halfsister to stallions *El Paso and El Azrak and full sister to mares *Eliza and *Elba. Beside Exessa she left Exessa's full sister *Edjora, broodmare supreme and dam of Kajora US Nat'l Ch mare. Before *Edjora was exported she left a daughter, Wiewiorka, who has continued the family.